Ex-Wales wing JJ Williams wants to see fly-half Dan Biggar replicate his Ospreys form for the national team against Australia. Biggar, 25, has been key to the Ospreys' unbeaten Pro12 start and been handed the coveted Number 10 shirt. But Williams does not feel Biggar has reproduced his club form for Wales in the past. "If Biggar can step up and match the rest of the world then we'll be a top team," he said. "He does well for the Ospreys, but I haven't seen it yet on the international field." Biggar has been selected at fly-half for Wales' opening game of the autumn Test series against the Wallabies at Millennium Stadium on Saturday. Morriston-born Biggar has won 25 caps since his Wales debut in 2008 and has faced competition from Rhys Priestland and James Hook for the fly-half position. "I think outside-half has been the Achilles' heel for Welsh rugby for the last few years since Stephen Jones retired," Williams added. Australia's winning streak against Wales will be &quot;irrelevant&quot; when they meet on Saturday says Wallabies coach Michael Cheika. "We need someone to step up to the mark and control that game for the whole 80 minutes. "If he does then Wales will get over that hurdle, but it's going to revolve around him a lot." Warren Gatland's side have not beaten one of the big three southern hemisphere sides since 2008 - a 21-18 victory over Australia. 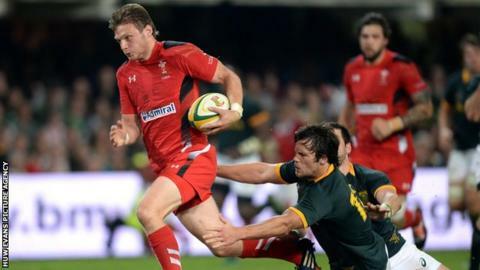 Since then Wales have lost their last nine games against Australia, a side they will face in the 2015 Rugby World Cup. Williams believes Gatland's side need to put down a marker ahead of the Pool A game at Twickenham on 10 October, 2015. "It's a good Australia team so it's going to be a special effort from Wales," said Williams. "But we're at home in Cardiff and now is the chance to do it. "We should win this game - we've got players at the peak of their careers. "If we don't put a real marker down it's going to get more difficult in 12 months' time because they will certainly be better in 12 months' time."